Adam Norris Dental Laboratory is able to offer services that were previously only available through your Dentist. We pride ourselves on the ability to give you, the patient, the choice of materials such as the different types of teeth we have available. These start with a budget range and go up to the latest advancements in natural looking teeth. As well as choosing the teeth, you the patient can also choose the type of denture base, choose from high impact acrylic, metal, the latest polyamide flexible dentures, or even a combination of these options. This allows you to choose the dentures that will best suit your needs and your budget. We understand personal fears and concerns regarding denture replacement and have the skill to eliminate the majority of denture problems such as improving the fit of a loose denture. Here at Adam Norris Dental Laboratory, our patients will feel welcomed by our small dedicated team. Our Clinic is patient orientated by working in a relaxed non rushed environment. We give patients time to decide. Staff at the Laboratory solely focus on working with dentures, from their simple repair to more complex cases. As such we may be able to offer patients, new up to date treatments which may not have been previously offered. Our Laboratory is located within the same building as the Clinic and so patients requiring repairs, additions or alterations can be offered a faster service than was previously available. In some cases, patients will be able to sit in the patient waiting area whilst their treatment is being completed. Some patients feel that after a time their old dentures may become loose and here at Adam Norris Dental Laboratory we are able to reline the denture to improve its fit and comfort.Some patients feel that after a time their old dentures may become loose and here at Adam Norris Dental Laboratory we are able to reline the denture to improve its fit and comfort. You can book to have a FREE 30 minute consultation with the Clinical Dental Technician, Adam Norris. During this consultation Adam will listen to you and your needs and discuss your requirements, he will inform you of all the options that are available. He will show you samples of materials to help you choose the denture that best suits you and your budget. A written, no obligation, treatment plan will then be provided to you covering all the options discussed at your consultation. This allows you the patient to decide in your own time which treatment option best suits you. 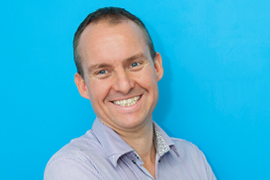 Once your treatment options have been finalised, the next appointment will involve Adam taking impressions for your new dentures and discussing the number of appointments required to complete your dentures. This will depend on which type of denture you decide upon and the complexity of the treatment. Another distinctive aspect to our clinic is that your dentures will be made by Adam in his own dental laboratory, this ensures that there is no loss of communication from the you the patient in the clinic to the technician in the laboratory which can sometimes happen. Adam will then fit the new denture in the clinic so he will see you right through the whole process. 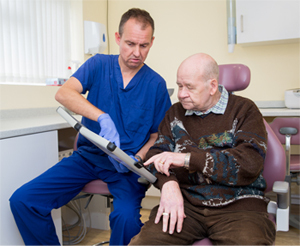 Patients will receive personal service at every stage of the choosing, making and fitting of their unique denture and will have direct access to Adam Norris to ensure the best possible service. We have FREE parking and are located close to Chelmsford's town centre and are on the number 45 bus route, towards Writtle, with stops less than 50m from the front door. 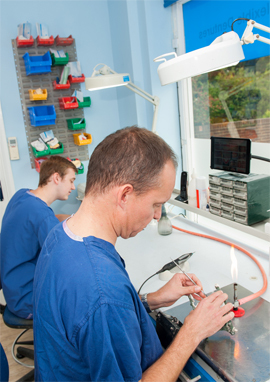 Adam Norris qualified as a Dental Technician in 1996 and has worked in dental laboratories since. He set up his own Laboratory in Writtle in 2002 providing denture services to Dental Surgeries in both the Essex and London areas. In 2009 Adam returned to studies to become a Clinical Dental Technician and graduated from the Royal College of Surgeons in 2011. Adam is registered with the General Dental Council and is listed as both a Dental Technician and a Clinical Dental Technician. Abby Pulham has worked at Adam Norris Dental Laboratory since April 2017. She is currently studying to become a qualified Dental Technician in Southgate, London. 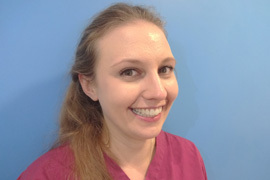 Abby previously worked as a dental nurse for 4 years in Chelmsford and Woodford. Abby assists Adam in the making and repairing of dentures here at Adam Norris Dental Laboratory and is very valued member of our team. 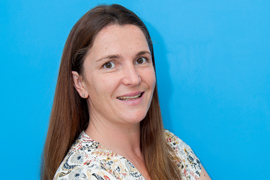 Jolene is involved in the daily running of Adam Norris Dental Laboratory and is usually found at the front desk to help with any queries about appointments and services that are available.